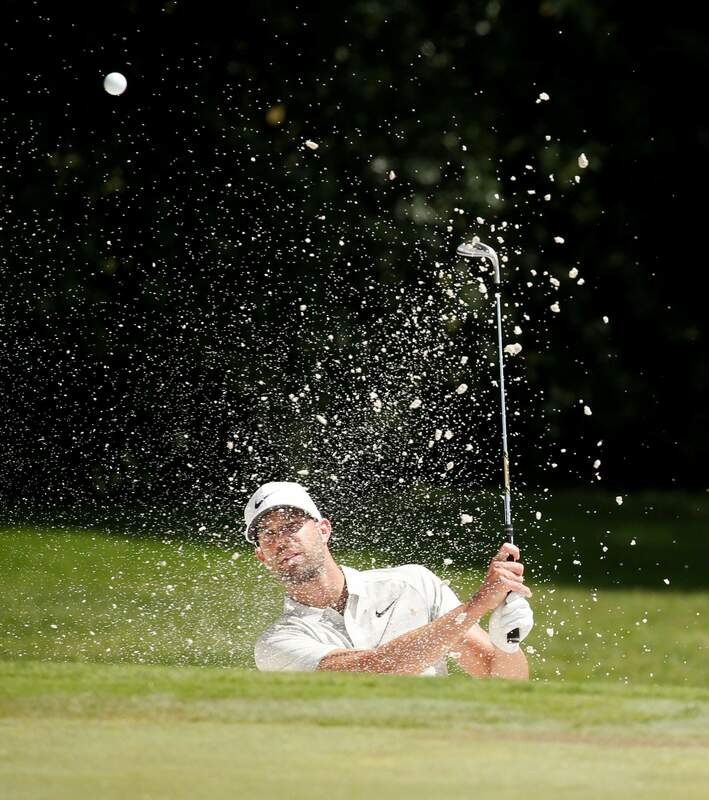 Kevin Tway chips out of a bunker on No. 8 during the first round of the Fort Worth Invitational at Colonial on Thursday in Fort Worth, Texas. 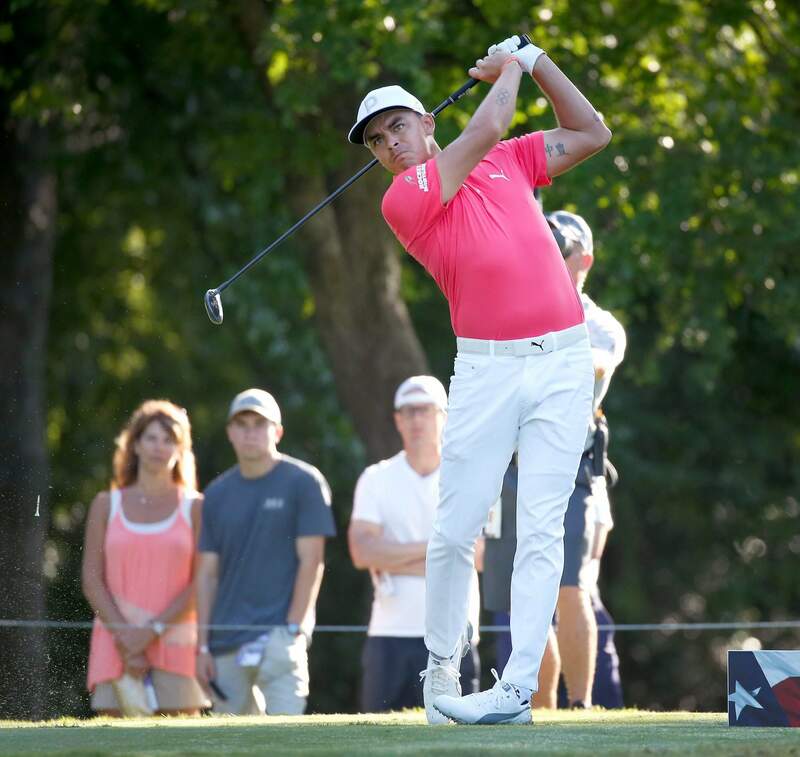 Rickie Fowler tees off on No. 12 during the first round of the Fort Worth Invitational at Colonial on Thursday in Fort Worth, Texas. 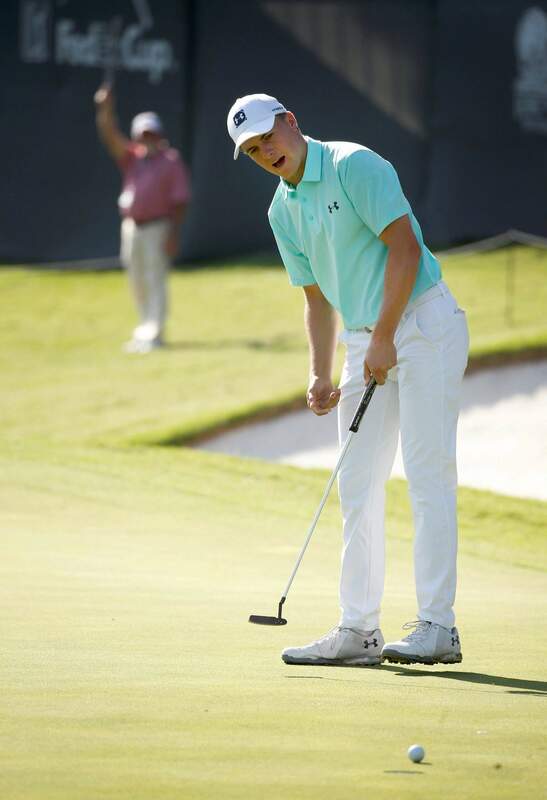 Jordan Spieth reacts to missing a putt on the 13th green during the first round of the Fort Worth Invitational at Colonial on Thursday in Fort Worth, Texas. 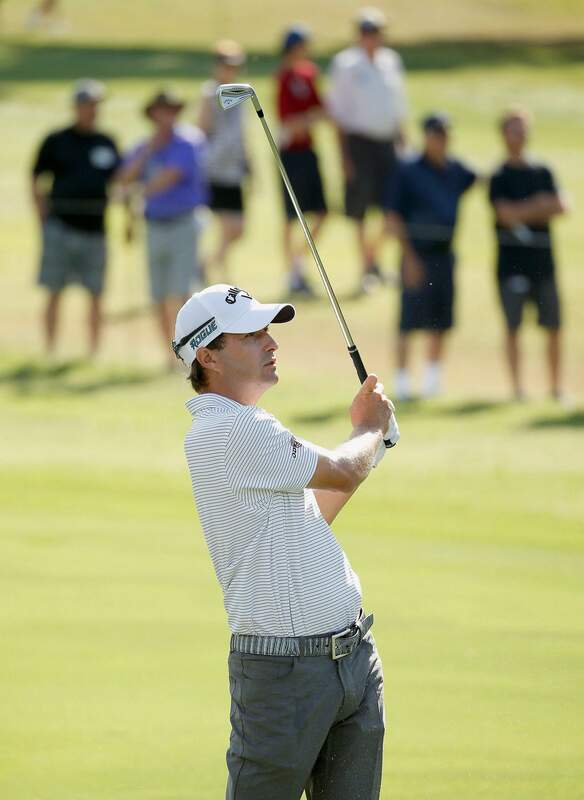 Kevin Kisner watches his approach to the 14th green during the first round of the Fort Worth Invitational at Colonial on Thursday in Fort Worth, Texas. FORT WORTH, Texas – Kevin Na stood over his ball after taking a drop in the rough beside the ninth green following two wayward shots, on his final hole of the day and with a share of the lead in the Fort Worth Invitational at Colonial. After starting the day with six consecutive pars, Na went 6-under on a five-hole stretch that he called one of the best in his career. There were birdies at Nos. 16-18 before his approach at the 558-yard first hole rolled to 3 feet to set up an eagle putt. He made a nearly 50-footer at the second. Asked about the unsponsored logo on his visor, which he bought for $22 at The Players Championship after the 30 percent discount for PGA Tour players, he said it was a goat. Na hopes to get Jack Nicklaus’ signature on that visor next week. Hoffman had birdies on four of his first seven holes, then three of his last four. Vegas certainly felt much better after the first round at Colonial this year. He birdied four consecutive holes on his second nine after his only birdies in first nine were the par 3s, Nos. 13 and 16. He had an opening 82 at Hogan’s Alley when not feeling well last May, the highest score in his 576 career rounds on the PGA Tour. That came after shooting 76 in the first round two years ago at the course that he always looks forward to playing. Vegas’ late birdie streak started with an 8-footer at the par-3 No. 4, the middle of a trio of holes known as the Horrible Horseshoe because of their layout and difficulty. He had an 11-foot par at the 476-yard dogleg left third, before the birdies at the long par 3 and the 467-yard 5th hole parallel to the Trinity River.